Get your hands on the amazing Comfee Glass Electric Tea Kettle with a built-in tea infuser. This strikingly attractive kettle is designed for fast water boiling and beverage brewing. With a digital control handle, you can control temperature options for water or tea. With a clear glass body, you are able to see the rate of boiling as well as liquid levels. It is very convenient with a 360-degree swivel base with cord storage. It is made for prime protection with a cool touch handle and auto shut-off feature. 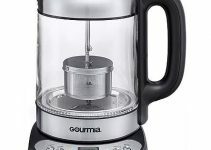 The kettle is made of high-end solid glass with demarcations levels that allow you to estimate liquids volumes and also see when the liquid boils from a standpoint. The glass is scratch-free and can be cleaned with ease. The stainless steel aids in aesthetic value and is BPA and ABS free. The smart precise control handle lets you choose the preferred temperature for boiling. Once the temperature is reached, it auto shuts off. The temperature control can also be programmed to keep liquids at preferred temperatures for up to two hours. The kettle has a temperature range setting of 212 degrees Fahrenheit. The built-in tea infuser is convenient for brewing different beverages while boiling water. You can brew coffee, soup, oat, tea or milk in the infuser at optimum 120 to 212 degrees Fahrenheit with the adjustable temperature control. It can be removed from the kettle to make more room for boiling. Learn some brewing tips. This Comfee electric kettle comes with a British Strix Thermostat. You set the preferred temperature for boiling and when it reaches, the thermostat auto shuts-off. If the kettle does not contain the minimum amount of water required to boil, it will automatically turn off to prevent any accidents. The kettle is made with a cordless base which makes the glass easy to carry around for servings. The power base can swivel at 360 degrees and also has bottom cord storage which makes it very portable and convenient to use. This kettle comes with a pop off lid with removable silicon loop for leak proof. The scale filter is also detachable. The removable lid, filter and silicon loop make it easier for cleaning the kettle. Relatively fast– the 1500 wattage of the kettle means it can boil water in a minimal fraction of the time. It can be used on a standard 120 volts with 60Hz working frequency. It boils full capacity of water in about 5 to 6 minutes. Safe– Comfee 1.7-liter kettle has passed the quality mark of BPA testing, BPA food grade, and FDA certified stainless steel. This shows that it is safe to use and does not have toxins that could harm users. The plastic handle of the kettle is made with precision heat resistance to protect your hands when handling it. Cost efficiency– the auto shut off feature allows for stoppage of current flow once the boiling temperature is attained saving you on electricity costs. The 1500 watts rating allows for fast boiling enhancing efficiency. Easy cleaning- the removable lid, filter and tea infuser allows for easy steam cleaning of the kettle. The high-quality glass and stainless steel body are easy to clean as it does not stain or stick. Storage– this kettle has a unique feature where the base has a cord storage feature which makes the kettle easy to store and more portable. Large capacity– it has a large volume of 1.7 liter which is ideal for making family tea or coffee. Like other electrical kettles, it cannot be cleaned efficiently as it cannot be completely submerged in water. The temperature control handle only displays temperatures in degrees Fahrenheit which can be inconvenient for offshore users accustomed to degrees Celsius. Comfee electric kettle stands out as among the best in quality and safety. With BPA certification of the materials used to make it, you can be assured that you are getting only the best. Its striking appearance adds value to excellent performance. The kettle comes with an instruction manual on how to operate it with ease. Comfee have made a statement and enhanced trust of clients in the brand with this kettle. 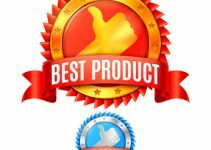 Don’t forget to browse the site for more reviews. Also, leave a comment and share.